An unusual set of celestial circumstances came together over Sunday night and the wee hours of Monday for sky watchers in Europe, Africa and the Americas, where the moon was fully obscured before lighting up again with a faint red glow. 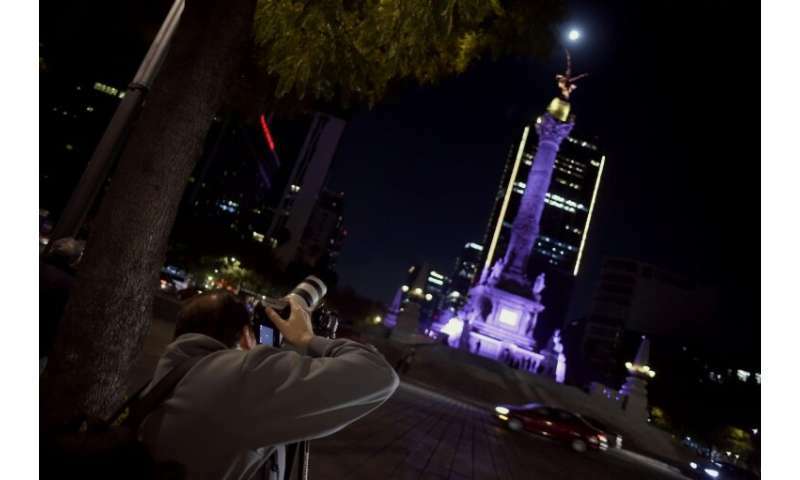 In the streets of Mexico City, Los Angeles and Paris and in the Moroccan desert, moon gazers turned to the sky to observe the phenomenon, around midnight in the Americas, and shortly before dawn in Europe and Africa. 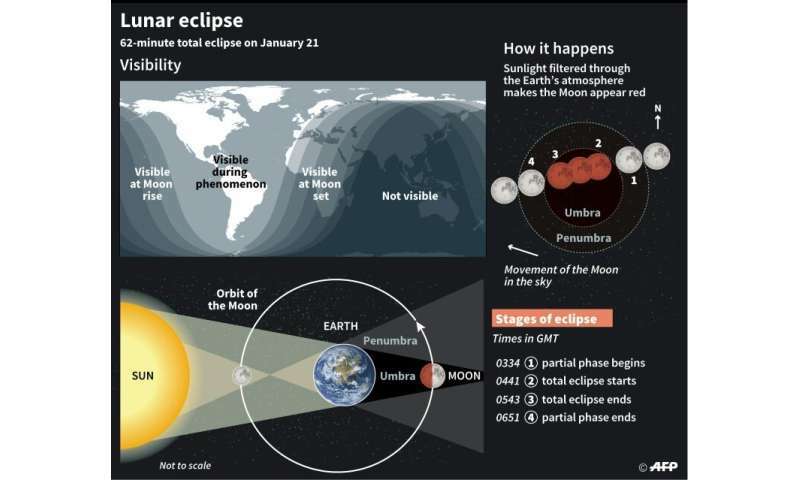 The eclipse lasted about three hours: during the first hour the full moon was gradually swallowed up by the shadow of the Earth, then an hour of total eclipse where it was not invisible but instead appeared tinted in hues of red, orange and pink, followed finally by its full reemergence, bright and shining. The full Moon appeared bigger than normal because it was closer to the Earth—about 222,000 miles (358,000 kilometers) away—earning it the nickname "super Moon." 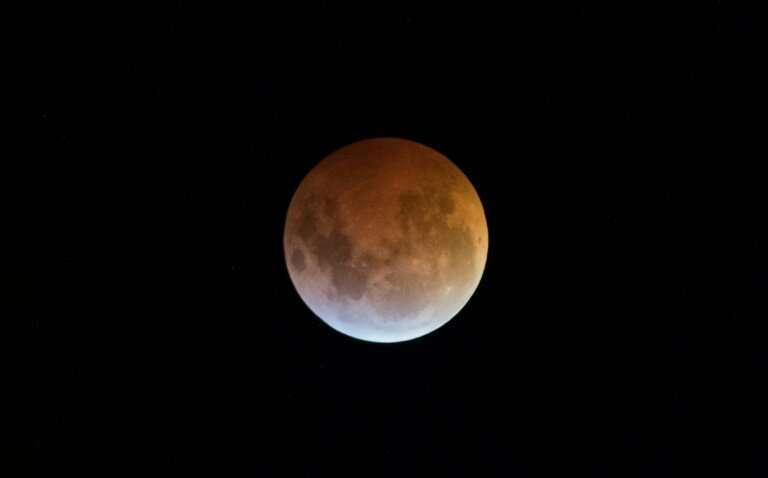 Other monikers include a "Wolf Moon," a traditional way of coining an eclipse in the month of January, and a "Blood Moon" because of its rusty, red color. Hence the name for this year's event: a "super blood wolf Moon." At its peak, where night skies were clear of clouds, Venus and Jupiter shone brightly in the night sky. Not everyone was fortunate: in London, for example, astronomy enthusiasts hopes were dashed by a cloudy night. "The color is due to Rayleigh scattering—where the Sun's blue light is scattered off molecules in Earth's atmosphere—which also happens at sunsets," explained the Royal Astronomical Society of Britain. 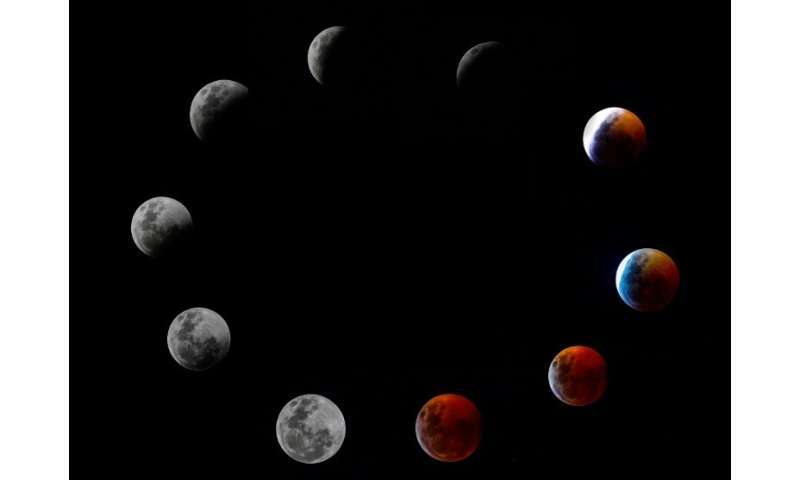 Second total lunar eclipse of year coming up Wed.